There are some subtractions from the previous quarter’s summary which we need to address in turn. And first of those would be to note the absence of California from the list. California did not provide units designated as batteries during the war. The previous quarter recorded artillery stores on hand with the 3rd California Infantry. 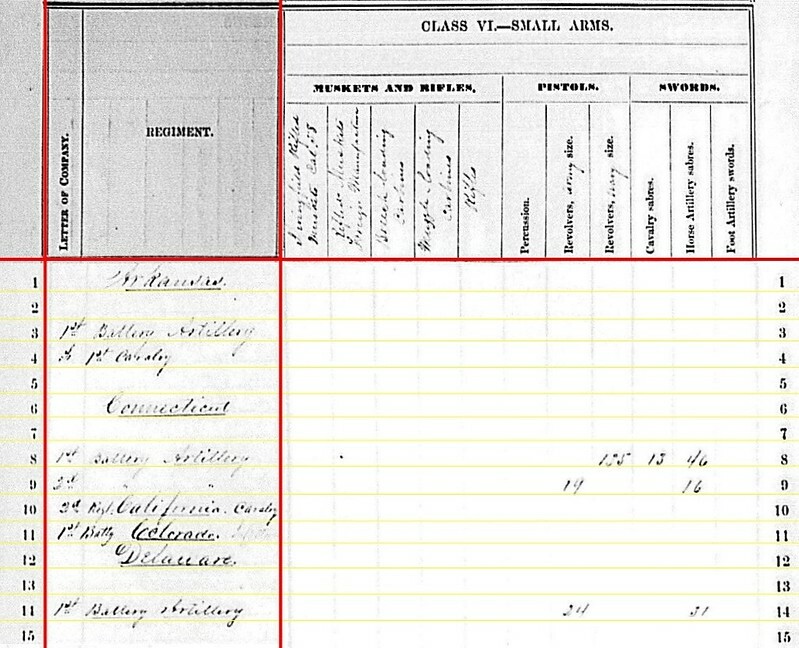 1st Connecticut Light Artillery Battery: Reporting at Beaufort, South Carolina with six 3.80-inch James Rifles. The battery shed two 12-pdr howitzers reported the previous quarter. Captain Alfred P. Rockwell commanded this battery, assigned to the garrison at Beaufort, Tenth Corps, Department of the South. 2nd Connecticut Light Artillery Battery: At Wolf Run Shoals, Virginia with two 12-pdr field howitzers and four 3.80-inch James Rifles. Captain John W. Sterling commanded this battery. It was assigned to Casey’s Division in the Defenses of Washington. The 3rd Connecticut Light Artillery would not be formed until 1864. 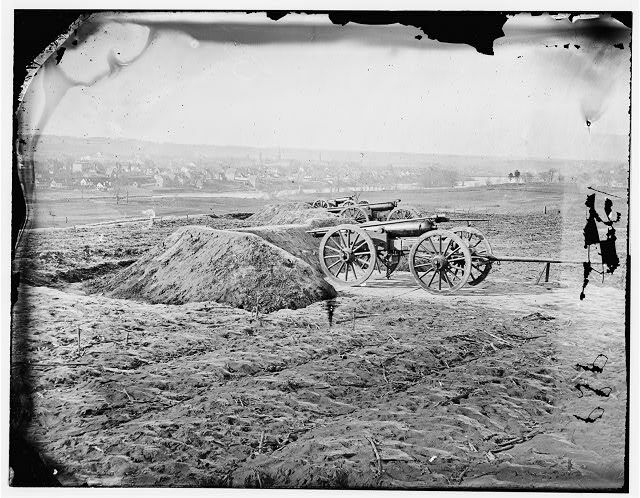 1st Delaware Light Artillery Battery: At Camp Barry, Washington, D.C. with six 3-inch Ordnance Rifles. 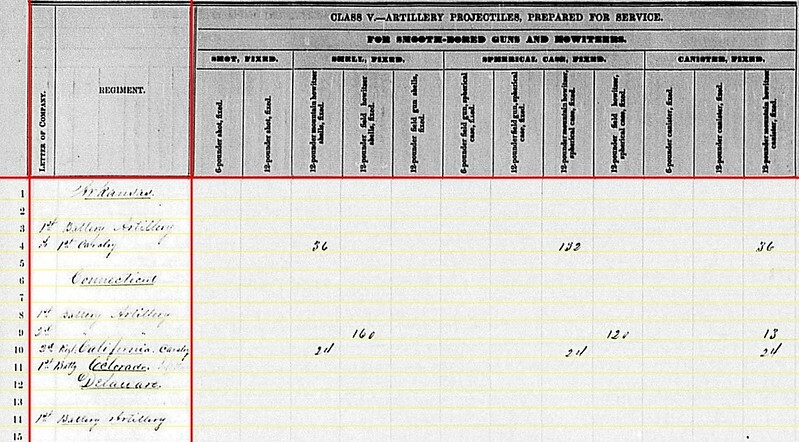 Note the battery dropped two howitzers off their charge and increased to a uniform battery of rifles. Captain Benjamin Nields was in command of this battery. At the close of the quarter the battery remained at the Artillery Camp of Instruction. But in April the battery moved to Norfolk, Virginia and became part of the Seventh Corps. Briefly, that is, part of the Seventh Corps. 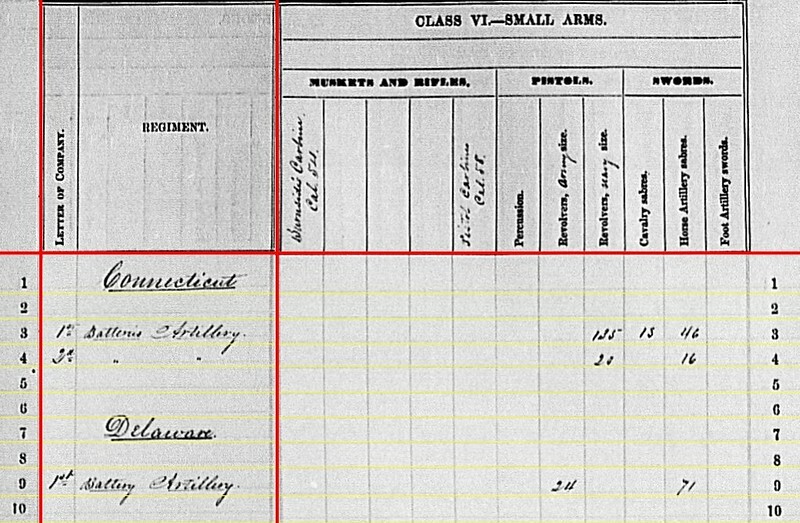 2nd Connecticut reported 110 shell, 158 case, and 29 canister for their pair of 12-pdr field howitzers. 1st Connecticut: 90 percussion shell, 120 fuse shell, and 468 bullet shell of Hotchkiss-type for the 3.80-inch James rifle. Cumbersome way of explaining this, but think – these are Hotchkiss projectiles made for James rifles. 2nd Connecticut: 229 Hotchkiss bullet shell for 3.80-inch James rifles. 1st Delaware: 75 canister, 40 percussion shell, 80 fuse shell, and 474 bullet shell for 3-inch rifles. 1st Connecticut: 190 Hotchkiss canister for 3.80-inch James Rifle; 225 James canister 3.80-inch James rifle (redundant, but to be clear – James-type projectile for use in James rifle). 1st Delaware: 40 Dyer canister 3-inch rifle. 1st Connecticut: 978 Schenkl shell for 3.80-inch James Rifles. 2nd Connecticut: 291 Schenkl shell for 3.80-inch James Rifles. 1st Delaware: 86 Schenkl shell for 3-inch rifles. 1st Connecticut: 135 Navy revolvers, thirteen cavalry sabers, and forty-six horse artillery sabers. 2nd Connecticut: Twenty Navy revolvers and sixteen horse artillery sabers. 1st Delaware: Twenty-four Army revolvers and seventy-one horse artillery sabers. So a quick summary for the batteries from these two states. I mentioned some of the changes in reported cannons on hand above, but did not mention variations with the reported ammunition. Unlike many of the US Regulars, the Connecticut and Delaware batteries reports differed from quarter to quarter. Other than explaining the reduced number of entry lines, not a lot to question with these summaries. 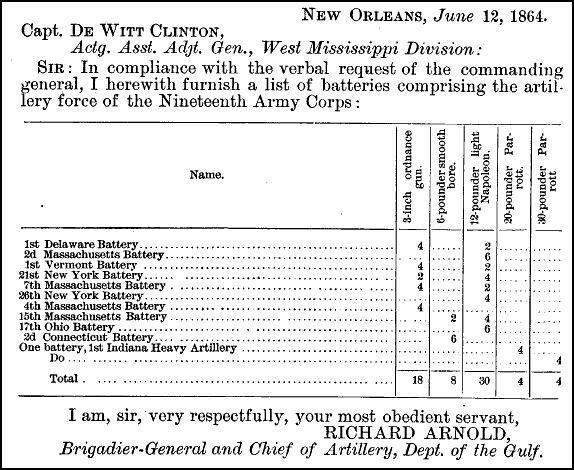 The majority of artillery batteries employed by Federal forces during the Civil War were volunteer formations from the states. 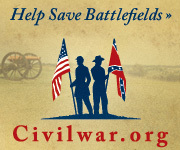 Indeed, with the initial call for troops, there were more volunteer artillery batteries than needed. Because the states were responsible for organizing and in some cases equipping these batteries, there were many variations – organization, training, equipage, and others. Most of the “workable” variations were flushed out by the end of 1862. As I’ve discussed before, senior artillerists focused on organization and training as early as the summer of 1861. But the Federals were stuck with some of these variations, for better or worse. From the administrative perspective, the naming of units is perhaps the most annoying to the researcher. Some states conformed to the same conventions as the regulars – regiments with lettered batteries. Others simply went with an ordinal number for each battery (1st, 2nd, 3rd, etc.). Some states, New York for instance, used both. There were separate regimental systems for “light” and “heavy” artillery. And… and… some states just seemed to adopt a “whatever” approach. Thus the volunteer batteries were often cited by different names in reports. Add to the confusion the practice of calling the battery by the commander’s name (or mustering officer’s name) in the field. Makes one glad the alternate designations section appears in each OR volume. That aside, there were also interesting variations with the equipment used by these volunteer batteries. We’ll see more hand-written column headers as we proceed. And those lead to some interesting research trails to say the least. 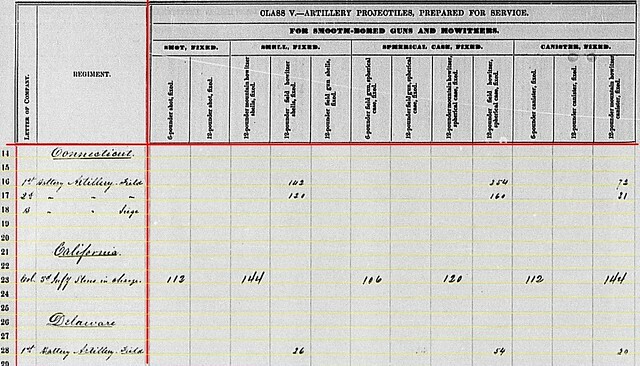 Over to the far right, we see a written column – “Siege Gun 1861, 4.5 in bore, …..” I don’t know what the last line in that nomenclature is, but know that the weapon cited was one of my favorite – the 4.5-inch rifle. 1st Battery, Connecticut Field [Light] Artillery – Beaufort, South Carolina with two 12-pdr field howitzers and six 3.80-inch James rifles. The 1st Battery was assigned to the Department of the South. 2nd Battery, Connecticut Field [Light] Artillery – Occoquan, Virginia with two 12-pdr field howitzers and four 3.80-inch James rifles. Officially part of the Military District of Washington, the 2nd Battery was assigned to duty at Wolf Run Shoals. Battery B, 1st Connecticut Heavy Artillery – Falmouth, Virginia with four 4.5-inch siege rifles. This battery was assigned to the Artillery Reserve, Army of the Potomac. 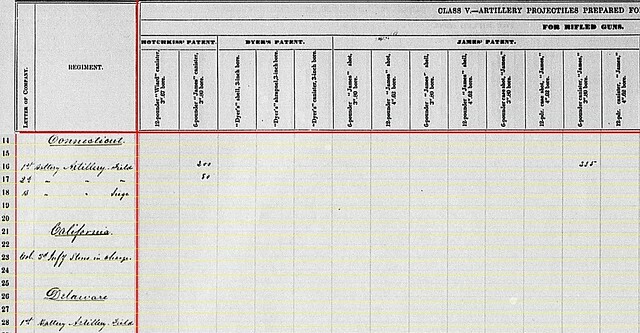 No mention in the summary of Battery M, 1st Connecticut Heavy, which was also assigned to the reserves at this time. The two batteries were for all intents combined during their service in the field. Moving out to California, one line is offered. But it is not for a battery, but rather for 3rd California Volunteer Infantry having “stores in charge” that included two 6-pdr field guns and two 12-pdr mountain howitzers. These were at Camp Douglas, Utah. Keep in mind that the 3rd US Artillery had men assigned out west without artillery. Yet we have the 3rd California Infantry with artillery without artillerists. Go figure. Yes, enough time transpired between the two data points that guns may have changed out. But I would submit it is more likely the wrong column was used in the summary due to a mistake at some point in the data gathering. 1st Connecticut Light: 12-pdr field howitzer projectiles – 142 shells, 254 case, and 72 canister. 2nd Connecticut Light: 12-pdr field howitzer – 120 shells, 160 case, and 31 canister. 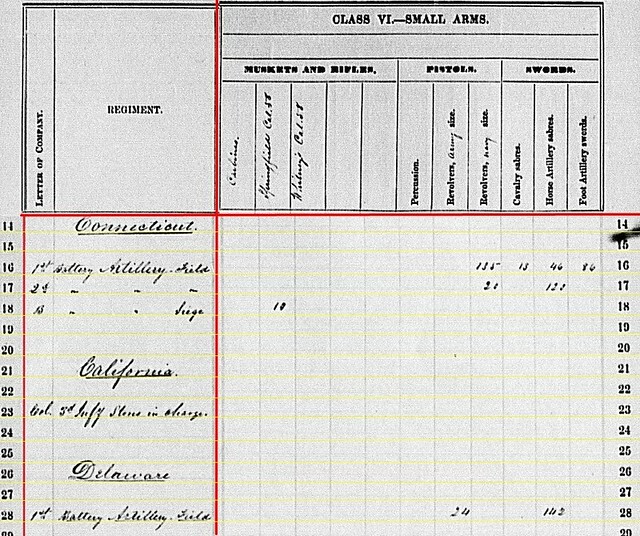 3rd California Infantry: 6-pdr field gun projectiles – 112 shot, 106 case, and 112 canister; 12-pdr mountain howitzer – 144 shell, 120 case, and 144 canister. 1st Delaware: 12-pdr field howitzer – 26 shell, 54 case, and 20 canister. 1st Connecticut Light: 6-pdr 3.80-inch projectiles – 120 Hotchkiss percussion shell, 120 Hotchkiss fuse shell, and 518 Hotchkiss bullet shell (case). 2nd Connecticut Light: 6-pdr 3.80-inch – 70 Hotchkiss fuse shell and Hotchkiss 168 bullet shell (case). 1st Delaware: 3-inch projectiles – 77 Hotchkiss canister and 340 Hotchkiss bullet shell (case). Note the quantities for the 1st Connecticut. 1st Connecticut Light: 6-pdr 3.80-inch – 200 Hotchkiss canister and 235 James canister. 2nd Connecticut Light: 6-pdr 3.80-inch – 50 (or 80?) Hotchkiss canister. 1st Connecticut Light: 6-pdr 3.80-inch – 1,078 Schenkl shells. 2nd Connecticut Light: 6-pdr 3.80-inch – 316 Schenkl shells. 1st Delaware: 3-inch – 94 Schenkl shells. Notice the variety of patent-types within the two Connecticut batteries. Recall that mixing such types caused problems in the field. And of course the quantities. All told the 1st Connecticut Light had 2271 projectiles. Their friends in the 2nd had but 604 (or 634, if I misread the one line). At some point I will pull the numbers and make observations about the “load-out” for a battery, circa December 1862. I suspect the 1st Connecticut will break the bell curve. Last note about the projectiles – there are no entries for 4.5-inch to cover the heavy Connecticut battery. So we are left not quantifying how well stocked (or not) those guns on the Rappahannock really were. 1st Connecticut Light: 135 Navy revolvers, 13 cavalry sabers, 46 horse artillery sabers, and 86 foot artillery sabers. 2nd Connecticut Light: 20 Navy revolvers, 122 horse artillery sabers. 1st Delaware: 24 Army revolvers and 142 horse artillery sabers. 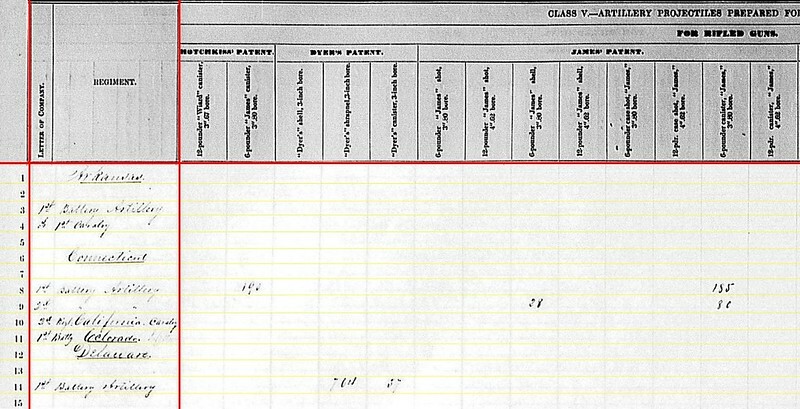 No entries for the California infantry, presuming those small arms were carried against a regimental return elsewhere. Again, roll the numbers around. Nearly every man in the 2nd Connecticut and 1st Delaware had their own swords, though pistols were in shorter supply. However, the 1st Connecticut, stationed in South Carolina, must have issued a revolver and sword for every man!